After going to summer school with Matt Tolmachoff and getting my diploma.I hung around the area and attended FCC while working for a company in Madera. Moved to Illinois to work for a creamery and attended U of Ill. at Urbana. Moved back to Fresno and worked for Dole DF&N then for Del monte, and I presently work for Sun Maid Growers/Sun Diamond of California in Kingsburg. We hit the road and travel or camp whenever we get the chance. So, if you have the room to park a trailer in front of your place let us know and we'll come see ya. I would go back and do it all over again. I had a lot of fun at MHS. Playing F-ball with Groot, John Howe, Johnny Dasilva, The Smith twins, and all of the gang. Hanging out with the Jungs, Dominic, Phillip, Clay, Eric, you all know who you are. And of course all the lovely ladies of MHS. ( too many to list) I had a great experience. I still cant beleieve coach Fink was caught in Roeding park. That was a shocker. Carlos Raygosa has a birthday today. 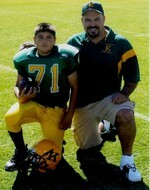 Christian and I Opening day football season.